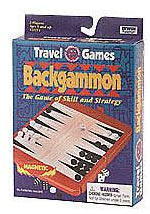 All the fun of Backgammon, but in a neat travel size. The board is magnetic to keep everything in place. Buy 1 for $7.05Buy 2 / Save $0.38!Buy 3 / Save $1.41! Size (inches): 1.57" X 5.51" X 8.07"